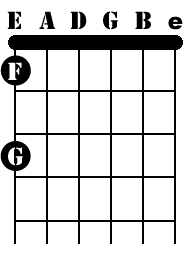 Let's get started with the guitar notes for each of the six strings. These notes are all considered natural notes in the traditional musical scale. Once I've covered all the strings and the natural notes within the first three frets, I'll move on to a breakdown of each string and where the natural guitar notes are located on the fingerboard. 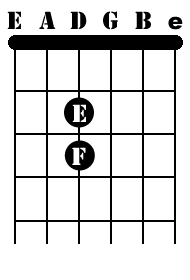 As you look at the diagrams below, the first chart in each section shows where the natural guitar notes are located on the strings. The second chard shows which finger you press on the fingerboard to play the note. It's important to pay attention to the fingers you use to play each note. That's why I have an additional chart showing which finger should be used for each note. You can review my ground rules for how I note everything on the getting started page. The top string of your guitar is the E string. This is the thickest string, and also called the sixth string. When you pluck the open string (open is when you're not pressing a finger on the fingerboard), this note is E natural. Following the charts, the next natural guitar notes on this string are F natural and G natural. Use your first and third fingers to play these. The D string is next in line and the fourth string. The open natural note is D, followed by E and F natural, played with your second and third fingers, respectively. You'll notice that with the sixth string, we started with E natural. On the fourth string, the D natural completes the guitar notes for the scale. So you've completed an octave (starting the scale over again at a higher pitch on the next note) - pat yourself on the back! The G string only has two notes, the G natural note played from the open position and the A natural note with your middle finger at the second fret. This is the third string in the sequence. The second string in open position is the B natural note. 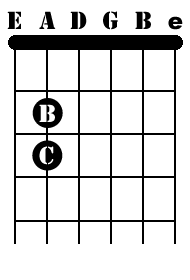 This is followed by the C natural note played at the first fret with your index finger and the D natural on the third fret. Use your ring finger here. The high e string is known as the first string on guitar and completes the guitar notes for both electric and acoustic guitar. This is the thinnest string on your guitar. Just like the sixth string, the notes are E natural, F natural and G natural. Now that you have all the basic natural notes for guitar, you probably notices that you didn't use all the notes on the guitar fingerboard at each fret. I purposely didn't get into a discussion of those other notes - the ones that fall in between the natural notes. These are known as 'sharp' and 'flat' notes. If you're ready for these, skip on over to the discussion of sharp guitar notes for scales.